Jack, Minnie, Rose, and more. Visit Our Danes page to see all our champions. There is currently a litter available from Nola and Odin. Coming soon – new puppies from Rose and Commissioner. 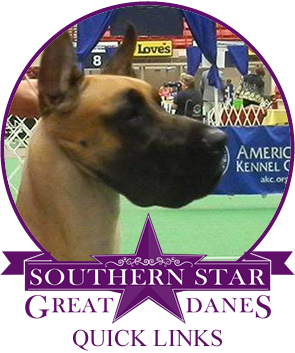 Southern Star Great Danes has provided countless owners near and far with superior Great Danes. Whether you’re looking for a show Dane or simply want to add a unique pet to your home to make it feel whole, we can provide you with exactly what you need. We have had tremendous successes with our breeding program, as evidenced by us having the number one Great Dane in the country right now. Our Danes are renowned for having wonderful, gentle temperaments; in fact, we routinely receive compliments about the tremendous personalities of our Danes. 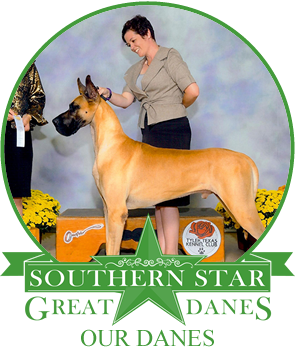 Due to the size of Danes, it’s vital that owners don’t have to worry about their temperament. As such, we won’t breed a dog that seems standoffish. In addition to their lovely temperaments, our Danes are also known for having outstanding conformation. Their body structures make them excellent show candidates, which is what many of our customers use them for. 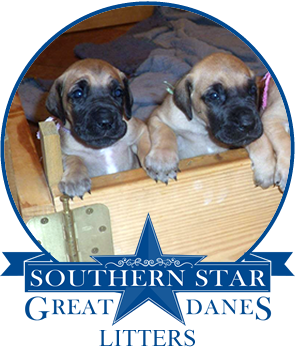 Please check out our ‘Litters’ page for updates regarding our next batch of puppies, or to fill out an online application for a Great Dane puppy. If you have any general or specific questions, please contact us today.